Application Deadline:14 June 2018, 23:59 CET (Brussels) time. The third edition of the Global Cultural Leadership Programme (GCLP) is made for you! 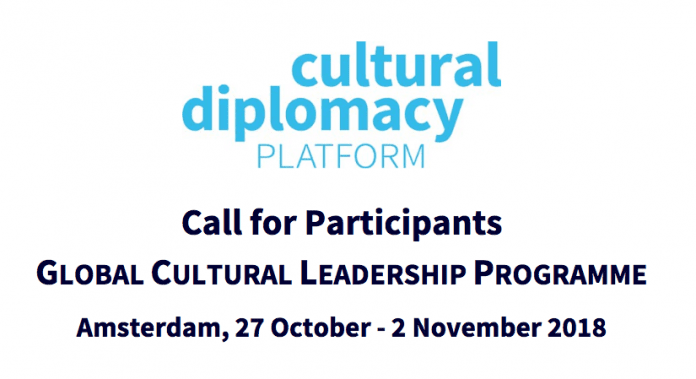 For the third edition of the GCLP, the Cultural Diplomacy Platform is looking specifically for applications from outstanding cultural managers from Brazil, Canada, China, Japan, India, Mexico, Russia, South Africa, South Korea and the USA (3 participants from each of these 10 countries), as well as from the 28 Member States of the European Union (10 participants, each from a different EU country). The Global Cultural Leadership Programme (GCLP) is a learning programme designed to develop and reinforce knowledge, competences and professional networks of cultural practitioners who are emerging on the international scene. Through its framework, content and methodology, which strongly builds on peer-to-peer learning, reflection and collaborative network building, the GCLP enables young leading managers of cultural organisations to gain fresh insights and develop new approaches to international cultural collaboration practices. The programme offers a set of applied learning modules, tools and manuals for practice-based learning, giving the participants opportunities to build meaningful collaborations at the global level and within the EU. The participants to the GCLP 2018 will come from different fields of relevant cultural practice in their respective countries and represent sectors that are specifically interested in reaching out with their work globally. This third edition of the GCLP will take place in Amsterdam, The Netherlands, from 27 October to 2 November 2018 (arrivals October on 27 and departures on 2 November). Travel, accommodation and meals are covered by the Cultural Diplomacy Platform. each one from a different EU country). • hold a relevant (leading) management position in their organisation. • show a strong awareness of intercultural sensitivities and are passionate about working on cultural issues and topics of global relevance. • are (preferably) 25-39 years of age. afternoon, departure 2 November by noon) and will include a working visit to Leeuwarden (Friesland), European Capital of Culture 2018 from 1 to 2 November 2018. Please note that candidates will be asked to fill in information on their CV, as well as an expression of interest (approx. 500 words), which should outline the candidate’s motivation, and what he/she can bring to the learning group for sharing with his/her peers during the training. Candidates should also state what they intend to take away from the training to their own working realities back home. The deadline for applications is 14 June 2018, at 23:59 CET (Brussels) time. Candidates will be selected by the management team of the Cultural Diplomacy Platform and selected tutors from the group delivering the programme. Selected candidates (30 from the ten Strategic Partners of the EU, and ten from the EU) will be informed about their participation by late July 2018. The management team will assist selected participants in their travel preparations (including visas) and bookings. Hello, Top of the day to you.